I have a confession to make. I do NOT like stuffing. I have tried, but I just haven’t found a recipe that excites my taste buds. 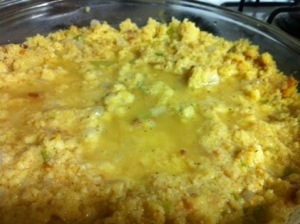 I do on the other hand LOVE cornbread dressing. As long as it is my grandmothers recipe. 🙂 It is so good, we can’t have it only one a year. We make this at least once a month. 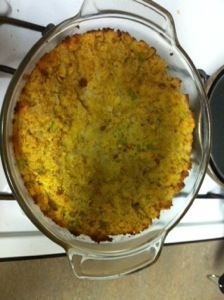 When I make the cornbread, I just do it in pie pans. 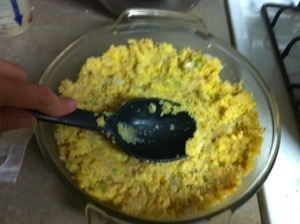 Dump it in a large bowl and crumble it up. Set aside. 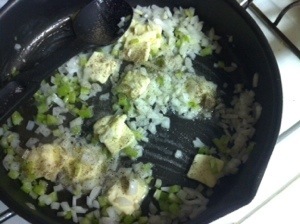 Sautee your butter, onion, and celery until the vegetables are soft. 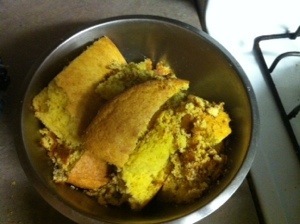 Dump your vegetables, eggs, sage, salt and pepper into the bowl of corn bread and mix well. 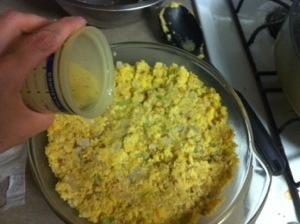 Pour about half of your chicken broth into the mixture. 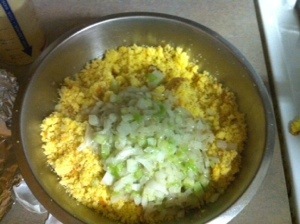 Pour the remaining chicken broth over the top. Use a knife and poke holes in it to make sure that the broth gets all the way to the bottom. You want the broth to puddle on the top. Yes, I know this looks gross. I promise you it is not. All this yummy broth will soak into the dressing when you cook it. You will be left with an incredibly moist dish in the end! Bake on 350 for about 30 minutes. The edges will begin to brown.